The study of the vast and enigmatic universe, the phenomena at work within it and the unfathomably large heavenly bodies that it encompasses makes one feel so tiny, so insignificant. We are mere specks compared to the size of our planet which is only a fraction of the size of the Sun. But there are stars out there that make even our Sun look like an insignificant fleck. 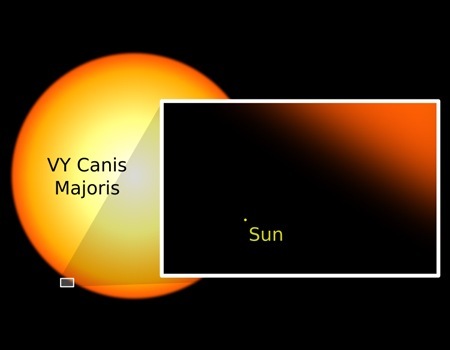 VY Canis Majoris is the Largest Known Stars of the Universe, Part of the Canis Major constellation, this hypergiant star (one with great mass and luminosity) is the largest known star yet, with a radius between 1,800-2,100 solar radii (2.7 billion kilometers approximately), which means it can encompass 900-1,050 Suns in a straight line from center to circumference! It is situated 4,900 light years from the Earth.